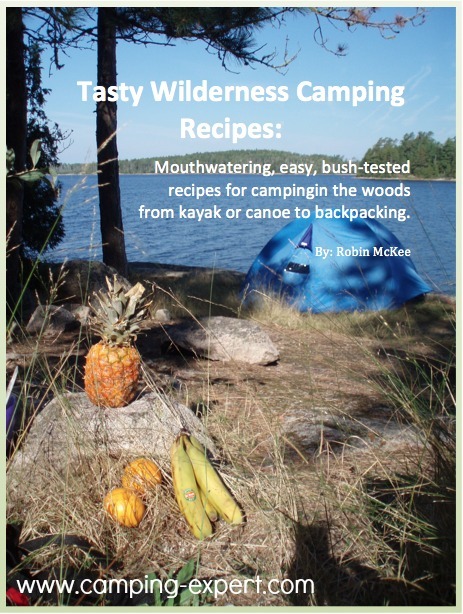 Mouthwatering, easy, bush-tested recipes for campingin the woods from kayak or canoe or backpacking. You have come here for camping recipes, right? Well, you have come to the right place!! Having spent years and years and years leading interior canoe trips, I have amassed a collection of THE favourite camping meals and snacks that were ALWAYS a hit on every trip. There are many camping cook books available, with even more recipes, but... are you really going to waste your time making and then trying tonnes and tonnes of gross tasting recipes. Trust me... I did. I bought a few of those books, made the recipes and many of them did NOT go down well (literally and figuratively speaking). One that i can remember fondly used ALOT of molasses. It tasted similar to Christmas cake, but it was not loved or liked. I ended up eating the WHOLE thing myself (I didn't want it to go to waste). So, over the years and trips, I have slowly I tried different recipes - a new 'experiment' meal each wilderness camping trip, and if it was loved, it would be taken on the next trip. If the experiment meal passed the grade on several trips it made it in to this book. So... if you have fussy eaters or just want plain simple food that tastes great in the woods. This book is for you. If you want to try some new foods, or techniques, such as dehydrating your own food. This is also for you. Plus, most of these camping recipes are easy to make and prepare and of course... taste delicious! What does the Camping recipes ebook include? Easy dehydrating tips, and why this is an amazing way to make delicious, cheap and lightweight food that's easy to prepare in the woods. There are 49 different meal and recipe ideas - from breakfast to dessert and all the snacks in between. No, there aren't HUNDREDS of recipes, because who really eats and prepares HUNDREDS of recipes? You want the BEST, tried tested and true recipes. That's what this ebook contains.